FIFA has reported on the second meeting of the committee, see below. The independent members have been identified, and the topics to be discussed include the question of the legality of Israeli settlement clubs playing in Israeli leagues. Otherwise, there has been no progress. Following the recent kick-off meeting in Zurich on 26 August, the FIFA Monitoring Committee Israel-Palestine, under the chairmanship of Tokyo Sexwale and comprising representatives from the Israel Football Association (IFA) and the Palestinian Football Association (PFA) led by their respective presidents Ofer Eini and Jibril Rajoub, today held its first meeting in the Middle East, in Tel Aviv. Attended by two observers, one representative of UEFA (Marios Lefkaritis, UEFA Vice-President and Executive Committee member) and one of the AFC (Sanjeevan Balasingam, Director of Member Associations), both of whom were invited by the chairman, the committee decided to develop sustainable and practical mechanisms together with a proper timetable to better deal with permit applications and avoid security-related delays with regard to the free movement of Palestinian people and goods connected with football. Furthermore, the final composition of the Monitoring Committee was agreed. 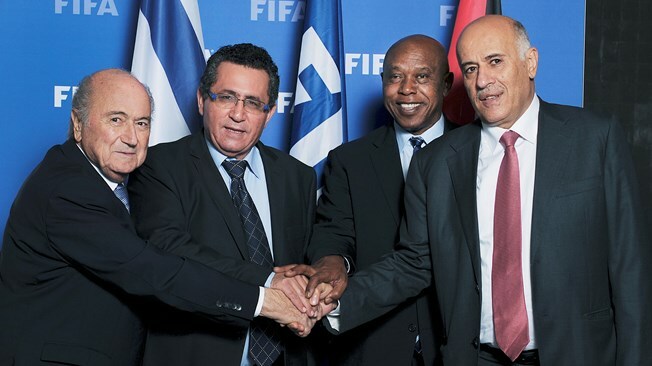 It will include chairman Tokyo Sexwale, IFA General Secretary Rotem Kamer, IFA Legal Counsel Efraïm Barak, PFA Director of the International Department Susan Shalabi Molano, PFA Legal Counsel Gonzalo Boye and two representatives of the FIFA Congress who were invited to join the committee, Juan Ángel Napout, President of CONMEBOL, and Victor Montagliani, President of the Canadian Soccer Association. The issue of the territories and the question of the five clubs that are affiliated to the Israel Football Association will be tackled at the next meeting of the committee, which will be held in Ramallah no later than 30 November. “I remain confident because there is good intention and positive commitment from all sides. At the same time, the issues confronting us are broader than football and it will take us all to put our best minds together and continue our tireless efforts to find creative and peaceful solutions. The FIFA grassroots course that finished today in Gaza confirms that both member associations are committed towards football development in the region as Israel facilitated the delivery of all the course materials”, said chairman Sexwale. “Sport, particularly football, has one global language. I want this language to have a positive and constructive impact on both our associations and countries,” said Jibril Rajoub. “We will continue to work closely together in the best interests of football. At the end of the process, I hope that we can find long-lasting solutions for all the issues and challenges,“ said Ofer Eini. The FIFA Monitoring Committee was set up following intense mediation work by FIFA President Blatter and subsequent approval by the 65th FIFA Congress.